At the end, in Bournemouth, amazed that we finished! I was sitting in the hotel reception at the end of Day 3, trying to stuff as much food down my throat as I can, while battling the overwhelming feeling that I wanted to chop off my legs to stop the pain. Yes, that was the low point of the entire 200 mile run along the coast. Up until that point, I had felt like I could go on forever. It was tough. My legs didn’t so much throb but ache. A dull ache. An ache that feels like it will never subside. I wondered how the hell I would be able to run the final day at all. Interestingly, I discovered that in 2015 when I ran the Kent coast, by the time I had hit a cumulative 150 miles during that weekend, my legs felt so bad that it was painful even to walk, let alone run. A disturbed night sleep followed, I wore compression socks, raised my legs by resting them on my foam roller and hoped for the best. By the morning, my legs were miraculously ready to go once more. And with an obligatory photo, I had forgotten the pain of the previous night, my strop over the lack of salt on the McDonalds fries, and simply got on with finishing the job. I often wonder about how much punishment the body will accept before either the mind gives up, or the body gives out. I don’t think I have hit that point yet, but I have come close. Dusk til Dawn – a 50 mile overnight race in the Peak District is one where I have come close (running dangerously up against cut off times at aid stations which feels really demoralising. While I have run it three times, I have only DNFd once (on my first 50 mile ultra). South Downs 100 – the pain in my legs at around 90 miles was impelling me to stop, along with lack of sleep, and heavily blistered feet, and using trekking poles to help me along. 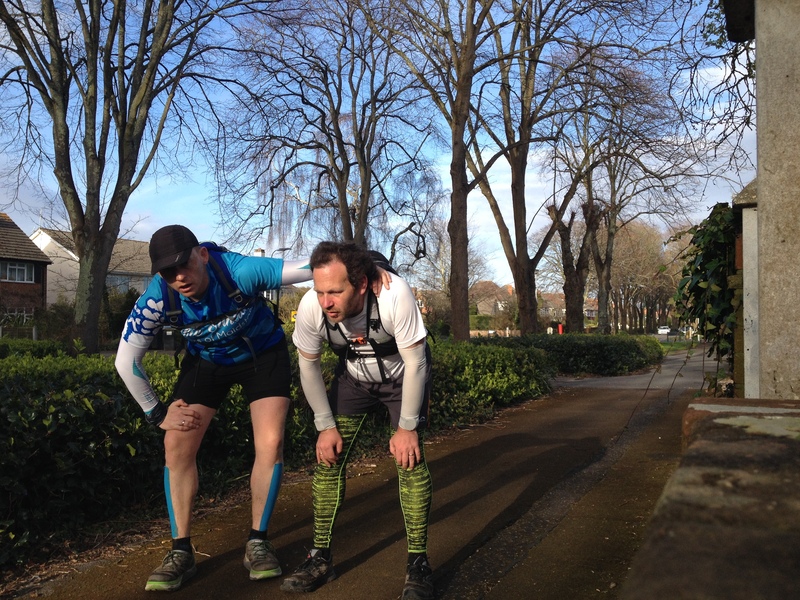 Runthecoast – Kent 2015 – when I had just 15 miles to go and I had developed shin splints and it was only with a heavy spray of deep freeze on my lower legs every 2 miles that I felt able to continue. Each time, I have understood what more experienced runners have told me, that pain is often temporary and if you can work through it, then it will usually go away. Often it is replaced by another pain or ailment but that’s a different story. The mind is also pretty adept at inventing perceived injuries, or problems, in order to justify stopping up short of completing the task at hand. It is at these points that it is really important that your body pushes through, one step at a time, to silence the interfering mind. Obviously I finished #runthecoast from Hythe to Bournemouth in 2016, but I did experience plenty of pain particularly in the last day, but the fact I was getting closer to the end with every step, shuffle, jogging step gave me strength. The last 5km of the run was 42 minutes. It felt much longer and probably the slowest “Parkrun” time known to man, woman or child. Try and break yourself beforehand by doing something really hard (could be a superfast 5km, or a really superhilly fell race, or a super long ultra, really hot marathon) – anything that tests your limits in many different ways. It is great preparation. Make sure that you learn from past experiences, if you are likely to develop blisters, then deal with them beforehand by taping your feet in the appropriate places. If you get a stone in your shoe – don’t ignore it – 10 miles later it will be a blister. If you know that your pack is rubbing your back, try and pad it, fix it tighter. Do something. Know that pain is usually temporary. Most pain is just temporary. It is not a portent of worse things to come. Most pain is around for a while and then 2 hours later will be gone. Don’t give up before you have to. This is true of checkpoints, don’t give up if you think you will be timed out – just carry on until you are. Don’t give up because you have a blister and you are worried about being able to finish. Fix it, carry on, and if you have a big problem, just wait until you can’t literally move – and then bail if you have to. Usually you won’t get to that point and you’ll be pleased you weren’t such a big baby. The mind can produce physical ailments. Don’t let it. Avoid Ibuprofen and painkillers unless you really really have to. I’ve experienced internal bleeding and stale blood in my stools after an ultra. Others have experienced worse. I can’t say don’t do it, but read up on it and be aware of the risks you are taking. Visualise or just dream of junk food. Many people will talk about visualising success or going over the finish line. I am not into that kind of stuff, but if you are then use it. For me, I just focus on one foot in front of the other, and try and distract my tiny brain into trying to spell complicated words or how to pronounce foreign place names. I tend not to talk so much towards the end of long runs, and friends will tell you that I tend to go pretty quiet. I sometimes thing about the food I will eat at the end. Usually junk. Sometimes curry, chinese, KFC or whatever. Music can help. I’ve read that it is a natural anaesthetic. What I know is that it can provide a mental lift, and can help you get on a little further. It can also help distract you from what you are going through, giving you a rhythm where you might have lost yours. Alter your cadence. Short step, long strides. Mix it up. It is as good as giving you a new set of legs (not necessarily feet) but can get you out of the funk of repetitive plod that you’ll inevitably get into. Walk a bit if you want to. Run when you feel able to. Cake, friends and hugs. If you can, arrange for friends to meet up at some points outside of aid stations, a hug can do wonders, and some cake (my favourite is Lemon Drizzle……mmmmmmm!) I have found www.racedrone.net really helpful for friends to track you down and give a smile, cake and a hug. Don’t focus on how far you have run. Or how far you have to go. Run with a GPS, sure. But don’t keep looking at it, or have it set up without the total distance on the display. I like to focus on the current mile. I have current lap distance, time, pace showing. Nothing else. I ban my friends from telling me, and when on a race because my memory is terrible, I have almost no idea which mile points each of the aid stations are. Want to complete what you are doing. The mind will usually give up before the body will. It will find lots of reasons why you should stop. Why you should give up. Why you are already amazing and have nothing to prove. Don’t be weak. Your body is stronger than your mind. While your mind is important at the start to get your body moving when it isn’t so keen….. Towards the end your mind will start finding excuses to stop. Ignore it. Get your mind on a different track. If possible just keep it quiet. Carry on. Above all, if something is important to you – finish it! Don’t quit. Hope this is helpful. The more experience I get running, the better I feel able to cope with pain. I think that is because I get new reference points….. e.g. this is nothing in comparison to that other thing I did when my body really hurt. What helps you get through difficult training runs, races, or social ultras? Tell me below. I can’t say don’t or do (I’m not a trained professional) but I’d make sure you understand the risks – and they can be pretty awful ! Good luck with your 100km – which one are you doing? http://trailtotriumph.com.au just the middle day.